It has been over six weeks since my last blog. Much too long. There are three reasons for my long absence. First, I was preparing for an 18-day trip to China. Second, I was taking an 18-day trip to China. Third, I was recovering from 18 days in China. A number of people have asked me what these trips are like. So, I thought it was fitting to do a blog about the trip, including where I went, what my strategy was for getting good photos and what my days were generally like. Sound good? If not, the good news is that there will be a blog post on a completely different topic in about a week. Where did I go in China? I flew into Guilin and spent 9 days there “on my own” with a local Chinese guide and driver. 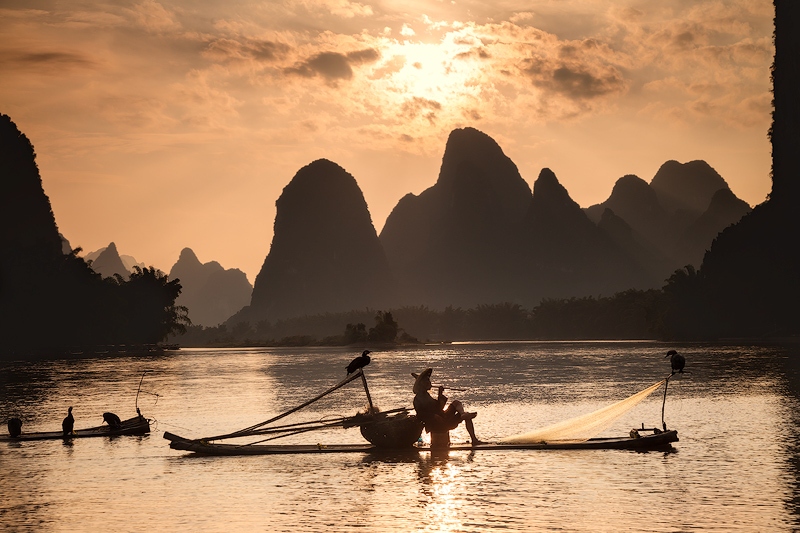 This area is known for the beautiful karst mountains and Li River, as well as the cormorant fisherman. The picture below has all three. A short drive away are the Longji rice terraces, which are amazing. I then traveled to XiaPu with a group of other photographers from Asia, led by Steve Chong (stevechong.com). 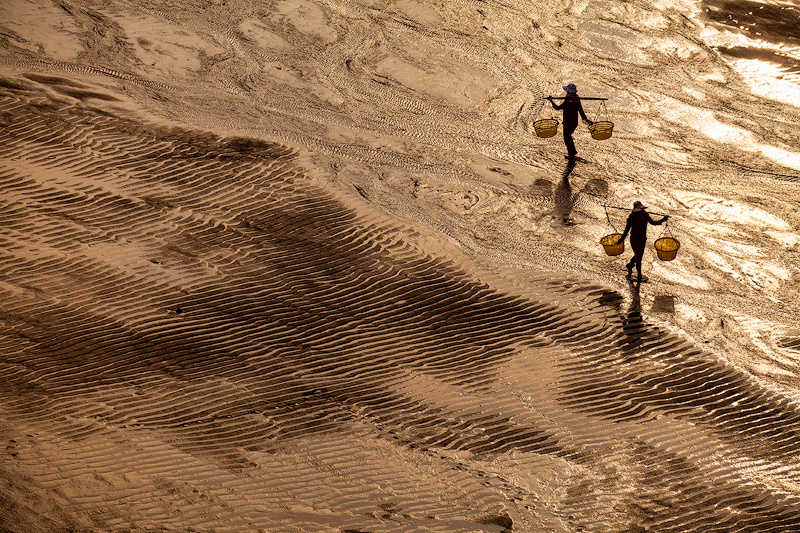 Steve has become a good friend and is very experienced at leading photography tours in Asia. XiaPu is well known for its painterly landscape scenery. What was a “typical” day like? While in Guilin, I had a routine that I followed every single day for all 9 days, without exception. Every morning, I woke up around 4:00 and got to a great landscape location for sunrise. This usually meant climbing a hill or taking a boat in the dark to the location, then spending perhaps 3 hours there. 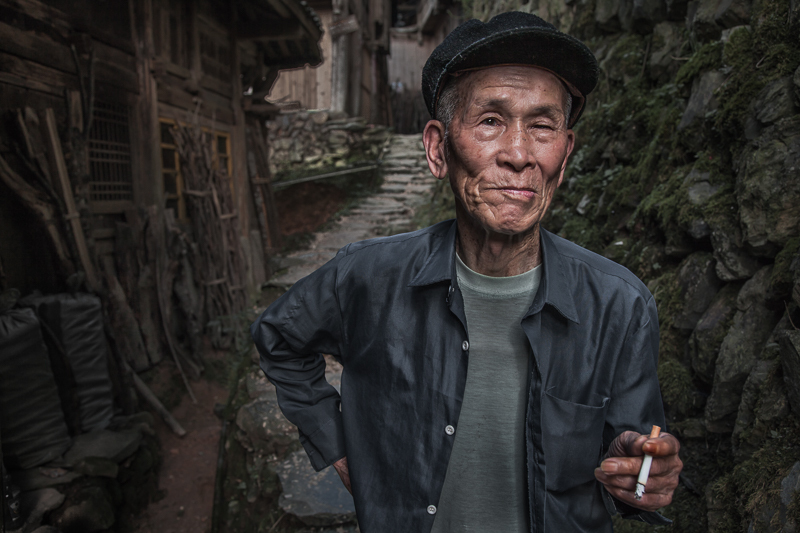 After coming back and having breakfast, I would take a short break and then head out to local villages where my guide and I would walk around in search of interesting looking people for portraits. Our typical strategy was to inquire where the older people of the village lived and go knock on doors. After shooting portraits, we would head to a sunset location, where we would stay until after the sun went down. Then, the day ended with traveling back to the hotel, followed by dinner, backing up my photos and generally getting to bed around 11:30 or 12:00. So, the basic routine was sunrise-portraits-sunset with a few meals in between. For the second half of the trip, I was with the group, so I followed the group’s schedule. Because this was focused more on landscapes and seascapes, most of the shooting was at the beginning and end of the day. What were the hotels and food like? I had specifically instructed my Guilin guide that keeping costs low was a priority over staying in nice hotels. Let’s just say that he took this seriously and that I stayed in some pretty bad hotels. In one case, there was a dead bug on the floor the size of a small bird.. and a rusted drain pipe in the sink, so that all of the water and whatever else going down the drain ran out all over the floor. The room hadn’t been cleaned in a long time as far as I can tell. In XiaPu, I was with the group and stayed in a very nice hotel and ate good food. What were your strategies for getting good pictures? First, I carefully chose my local guide in Guilin. I was on a budget and found a number of people advertising themselves as photography tour guides. However, the fact is that a number of these are tour guides who occasionally bring photographers around. I really needed someone that knew photography well, including what spots were good for sunrise and sunset. I needed someone that was used to working long hours, including getting up very early. 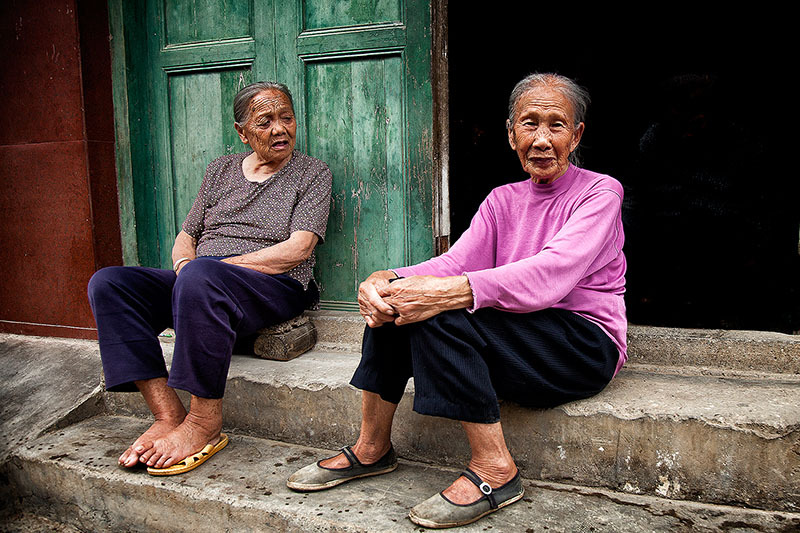 Also, I wanted someone that knew the local villages and could help arrange portrait shoots. Although there was a foreign guide or two available, I went with a well-connected, experienced local guide. Second, I planned for bad weather. In this part of China at this time of year, the weather does not cooperate most of the time. For my landscape locations, I built in at least two opportunities at each of the higher priority locations and then had a full free day at the end of the trip for going back to a spot where I didn’t get good weather. Also, I didn’t let bad weather deter me from shooting. Even if it was raining, I hiked to my location and waited for a break in the weather. This paid off a couple of times, such as with the picture below. Third, I made sure to keep the itinerary flexible. I made this clear up front when I booked my guide. 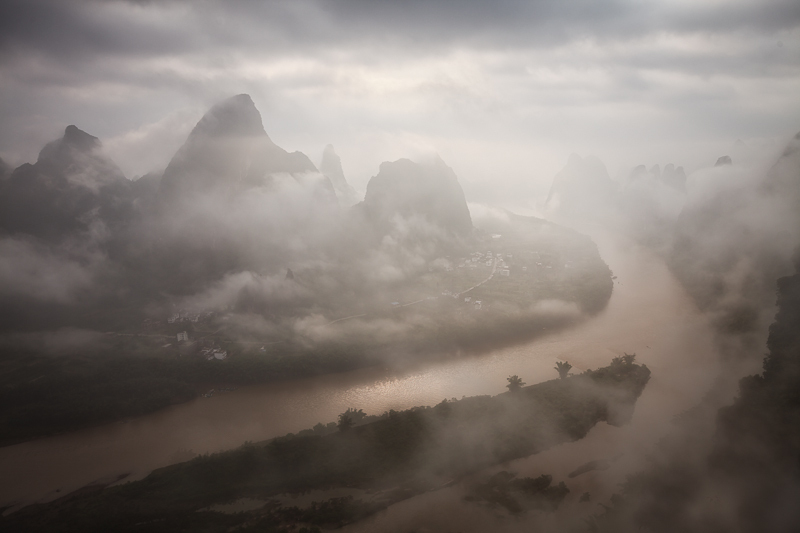 On the 2nd day of shooting, we learned that the Li River was still flooded from torrential rains the previous week. The Li River was so high that the cormorant fisherman could not be on the river. My guide suggested we wait it out a day and hope for the best the following day. Instead, I flipped the itinerary on the spot and we went to the rice terraces first, re-booking all the hotels and driving in the opposite direction. This turned out to be the right decision, since the Li River remained too high for the fisherman until the day we returned back from the terraces. Much of the trip would have been ruined if we hadn’t changed the itinerary. Fourth, I combined several different categories of subjects for variety. This was helped by combining the time on my own in Guilin, along with time with the group in XiaPu. Also, my focus on environmental portraits allows me to shoot during the day rather than only focusing on landscapes during the very beginning and end of the day. What were some of the challenges I faced? There are numerous challenges in a trip like this. For example, the travel logistics all went fine until the first day. Our flight into Hong Kong was diverted to Taiwan where we spent a night. This meant missing all my connections and my reserved hotel. I had to get on my phone to cancel and rebook flights and hotels. I also had one case where my local hotel name was not written in Chinese on the reservation, resulting in a very angry taxi driver. Sleep deprivation was a big challenge, as I averaged around 4 hours of sleep per night for 18 days. Lastly, I had to deal with a lot of rain, although I did have some good luck with the weather. One final note: an interesting experience. Back in 2012, I was in Guilin for four days and took the picture below. Fast forward three years later and I somehow ended up in the same village and came across these same ladies, sitting in the same positions on the same stairs and wearing the exact same clothes. This time, they had no interest in having their picture taken, but it was fun showing them the picture I took in 2012. Posted in Uncategorized on June 27, 2015 June 27, 2015 by Ken Koskela.